Winner of both the Nebula Award and the John W. Campbell Award for best science fiction novel, Timescape is an enduring classic that examines the ways that science interacts with everyday life to create the many strange worlds in which we live. In a future wracked by environmental catastrophe and social instability, physicist John Renfrew devises a longshot plan to use tachyons--strange, time-traveling particles--to send a warning to the past. In 1962, Gordon Bernstein, a California researcher, gets Renfrew's message as a strange pattern of interference in an experiment he's conducting. As the two men struggle to overcome both the limitations of scientific knowledge and the politics of scientific research, a larger question looms: can a new future arise from the paradox of a forewarned past? 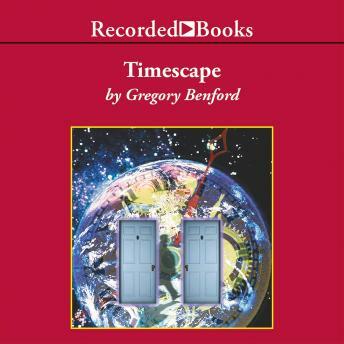 With multiple plot lines and diverse characters, Timescape offers something for all lovers of fascinating science and great fiction. Simon Prebble and Peter Bradbury combine for a narration that skillfully uncovers the mysteries beneath our understanding of the universe.